Our current book catalog features Florida history books and classic Florida Literature! For more than a century, Palm Beach County’s libraries have nurtured and shaped Florida’s unique history. From early residents’ efforts to bring literacy and a love of reading to the vast tropical wilderness of the nineteenth century, to modern-day book festivals celebrating the written word, Overdue in Paradise honors Palm Beach County’s individuals, social institutions, and municipal governments that created a culture of literacy in one of Florida’s largest and most prominent regions. Public, academic, and a variety of specialized libraries developed their own distinctive collections, enriching the lives of residents since Florida’s earliest pioneer days. Palm Beach County’s vast collections of books, media, and reference materials are both a cause and result of its cultural diversity, and have left an enduring legacy on residents and visitors alike. 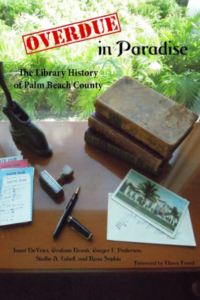 Overdue in Paradise: The Library History of Palm Beach County recounts the beginnings of many of South Florida’s earliest libraries. This legacy would not have been possible were it not for the valiant efforts of volunteers, professional librarians, and other community-minded Floridians who relentlessly sought out and obtained the resources needed to create collections that would serve their local communities. 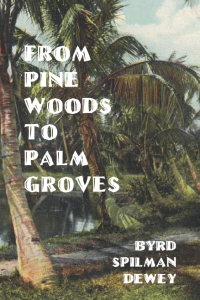 From Pine Woods to Palm Groves is a delightful tale of pioneer life in Palm Beach County. Byrd Spilman Dewey, Florida’s Pioneer Author, tells of her life in 19 century Palm Beach, before Henry Flagler built his resorts and made Palm Beach the playground of the rich and famous. The book tells of the Dewey’s first pioneer homestead, nestled in the sand pine woods. She describes her encounters with the Seminole Indians and surviving in the unforgiving South Florida climate. Their grand estate Ben Trovato, nestled in a palm grove, is then revealed, a stunning Victorian cottage on the shores of Lake Worth. Be enchanted by a long lost time in a wild and new paradise called Palm Beach. Also includes the bonus story The Tale of Satan. From West Palm Beachs beginnings as service town to Palm Beach, Standard Oil tycoon Henry Morrison Flaglers resort village, the city has evolved into a trendy art, cultural, and shopping mecca. Palm Beach Countys largest city serves as county seat and center of business, government, and commerce. Taming Americas last frontier saw the industriousness of pioneers and settlers such as Marion Gruber, the Potter brothers, George Lainhart, and Max Greenberg guide the Cottage City of yesteryear to todays gleaming metropolis. Meet many of West Palm Beachs pioneers, civic leaders, educators, business leaders, and entrepreneurs. 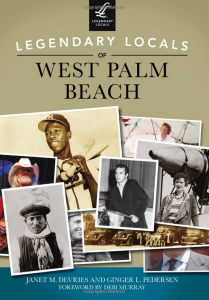 Learn about the heroes, celebrities, philanthropists, and even the villains who have contributed to the mosaic of West Palm Beach. This classic tale of a beloved dog takes place in Florida’s early days. Join Bruno on his adventures as he explores the wilds of South Florida with his human friends, Judith and Julius. Bruno will win your heart as he has with countless others for more than a century. This illustrated edition of Bruno has been authorized by the estate of Byrd Spilman Dewey and has been completely re-typeset and contains the bonus postscript story to Bruno, “Rebecca” not found in any other edition of Bruno. 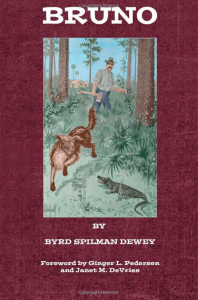 Compiled for the first time, Florida pioneer author Byrd Spilman Dewey’s books, short stories, magazine articles, newspaper articles and essays bring back a forgotten South Florida paradise of more than a century ago. This volume includes her national best-seller Bruno, and books From Pine Woods to Palm Groves and The Blessed Isle and its Happy Families, along with her shorter pieces of fiction and nonfiction. 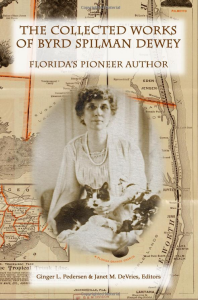 Read the enchanting tales of the Dewey’s life in their beloved South Florida and the Lake Worth Country with their menagerie of cats and dogs that graced their Florida homesteads. Palm Beach’s sunny and idyllic shores had humble beginnings as a wilderness of sawgrass and swamps only braved by the hardiest of souls. Two such adventurers were Fred and Byrd Spilman Dewey, who pioneered in central Florida before discovering the tropical beauty of Palm Beach in 1887. Though their story was all but lost, this dynamic couple was vital in transforming the region from a rough backcountry into a paradise poised for progress. 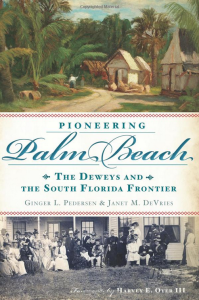 Authors Ginger Pedersen and Janet DeVries trace the remarkable history of the Deweys in South Florida from their beginnings on the isolated frontier to entertaining the likes of the Flaglers, Vanderbilts, Phippses, Cluetts, Clarkes and other Palm Beach elite. Using Birdie’s autobiographical writings from her best-selling books to fill in the gaps, Pedersen and DeVries narrate a chapter in Florida’s history that has remained untold until now.